Letting Go of Stuff: My 2018 Purge Piles - great motivation! 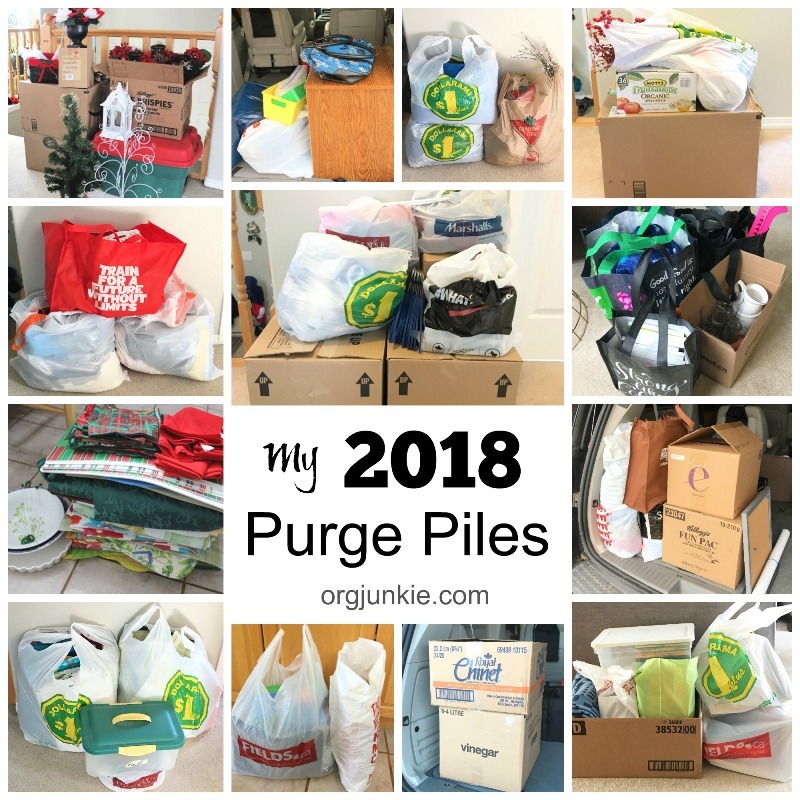 Hey there, as I do every year at this time, today I’m sharing with you my 2018 purge piles. And as a refresher, we are also going to talk about purging in general and why I think it’s so important. This isn’t just something I preach friends, I most definitely walk my talk. Check out my evidence right here in my purge pile collage of 2018. Need more motivation? You may also want to check out my 2017 purge piles. My purge piles aren’t from one big declutterathon either. Nope these piles were collected all throughout the year. These are my regular maintenance piles. This is what keeps my home organized. Regular household purges are where it’s at for keeping clutter out of my life. I’ve written about it many times before including how to actually make regular household purges happen. In Marie Kondo’s book, The Life Changing Magic of Tidying Up (affiliate link), she says there are two types of tidying. Daily tidying which consists of using something and putting it back in its place and special event tidying which is a once-in-a-lifetime event of discarding items that don’t spark joy and putting your house in order. I may be on board with her other techniques but this is where I am going to have to disagree with her. Unless you live in a complete bubble, decluttering can’t be just a one time event. Many people don’t understand that purging and organizing must go hand in hand. Even my husband thinks organizing just means putting stuff in pretty containers. Umm no that is not quite how it works because if this is all you do, I can guarantee that in just a few months you’ll be right back where you started. It won’t solve the clutter problem. The things that spark joy for us today may not tomorrow. That means we need to be regularly assessing the things in our homes for whether or not they are still making us happy and serving a purpose. If they aren’t why keep it? Purging isn’t once and done because as we change our habits, styles and interests, we continue to buy new things. And that’s okay. We should want our homes to reflect who we are now and not who we once were in the past. That can’t happen if we don’t continuously purge out the old and/or unused stuff. I often post my purge piles on Instagram so be sure to follow me there if you aren’t already. I think a constant evaluation of consumerism also goes hand in hand with decluttering. I’m really trying to consume less, buy less, etc, in order to avoid the constant need to edit and discard, which always feels wasteful and tempts me to hold on to too much. Yes exactly Claire, that is simplicity at it’s finest for sure. Great ideas! Thanks for your thoughtful insight.